Hello gentle reader and Happy New Year! I’m starting off 2013 with THE book I can’t wait to read this year: The Ocean at the End of the Lane by Neil Gaiman (expected publication: June 18th 2013 by William Morrow Books). It’s no secret I love Neil Gaiman’s books and I’m very excited by the prospect of reading his new Adult Fantasy book. “THE OCEAN AT THE END OF THE LANE is a fable that reshapes modern fantasy: moving, terrifying and elegiac – as pure as a dream, as delicate as a butterfly’s wing, as dangerous as a knife in the dark, from storytelling genius Neil Gaiman. What do you think? Are you looking forward to reading this book? Or do you have another book you’re eagerly anticipating? Feel free to leave me a comment below! “Waiting On Wednesday” is a weekly event, hosted by book blogger Breaking The Spine, that spotlights upcoming releases that we’re eagerly anticipating. You can see what other bloggers are waiting for here. As the end of the year draws near, I am looking back at 2012… I already mentioned a few TV shows I watched this year in this post. And today I’d like to give you a list of my favourite 2012 debut authors. I have interviewed a few of them on my blog and you can click on their names to read those interviews. What did you read in 2012? Which debut author did you discover? Feel free to leave me a comment below! Does it mean the end of the World? Which books would you save if the world was coming to an end? The giveaway runs from today until Friday, December 21st 2012 and it is a chance for me to share with you a book about the end of the world. I have chosen to give away A SIGNED COPY of Eve by Anna Carey (paperback, US edition). The giveaway is international. Assuming the worlds is still spinning the winner will have a new YA Dystopian book just in time to start off the new year right! I realise I haven’t done a “Book of the Week” post in a while, but this is because I have been reading a series of books by YA Fantasy author Megan Whalen Turner and I wanted to finish it before I shared it with you. Nicknamed The Queen’s Thief by its readers (MWT has no name for it herself), the series has four books so far, with 2 more announced. The first book in the series, The Thief, was published in 1996 and it won the Newbery Medal in 1997.The following books are The Queen of Attolia (2000), The King of Attolia (2006), and A Conspiracy of Kings (2010). This YA High Fantasy series is not well known, and I came across it because Sarah J. Maas (author of 2012 debut Throne of Glass) recommended it. And I’m so glad I went ahead and read it. Not only is this series so well written it makes me want to weep, it is also a very clever, audacious and captivating example of great High Fantasy for young adult readers. Each book plays with points of view, has a smart twist at the end and explores themes such as religion, politics and personal choices. The main character, Gen, is nothing like you’ve read before, I promise. And if you haven’t read this series yet, I suggest you get it sooner rather than later, because you’re missing out. The king’s scholar, the magus, believes he knows the site of an ancient treasure. To attain it for his king, he needs a skillful thief, and he selects Gen from the king’s prison. The magus is interested only in the thief’s abilities. What Gen is interested in is anyone’s guess. Their journey toward the treasure is both dangerous and difficult, lightened only imperceptibly by the tales they tell of the old gods and goddesses. This week I am reading What Kills Me by Wynne Channing (published June 2012 by Jet & Jack Press). It is a YA Paranormal romance. I don’t usually read that kind of books, but I won a copy on Kayla Curry’s blog during her Trick Or Tweet Giveaway. And it’s a story about vampires, so I really couldn’t say no to reading that book! 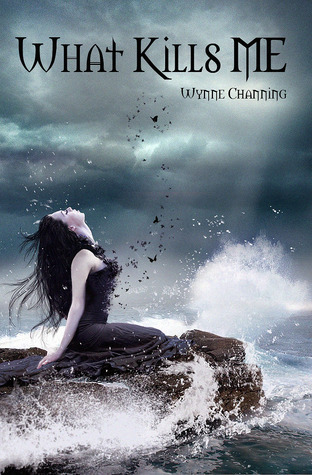 An ancient prophecy warns of a girl destined to cause the extinction of the vampire race. 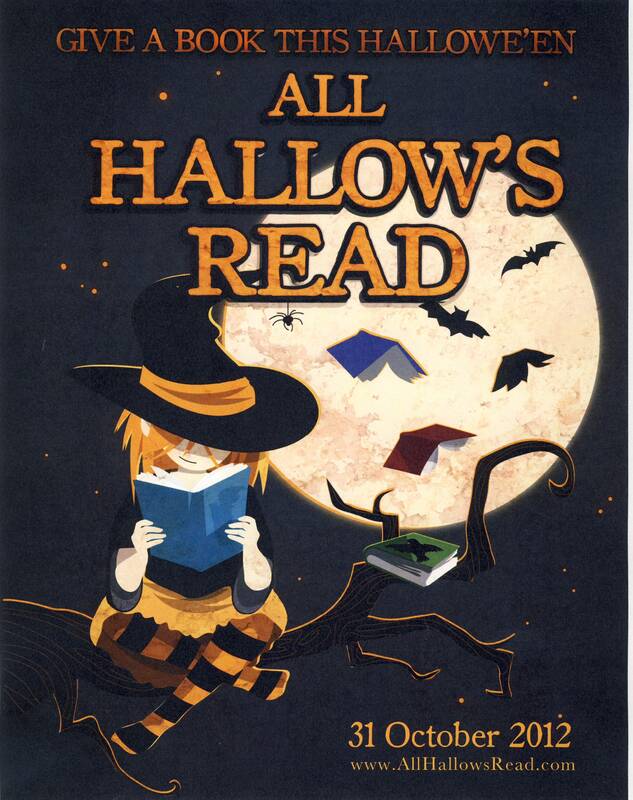 Halloween is one week away and I have decided to take part in an awesome initiative called All Hallow’s Read. The idea? Give someone a scary book for Halloween. 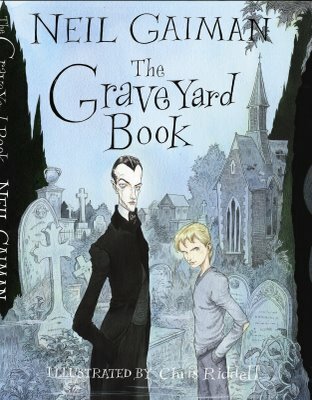 So I’ve chosen to join this initiative by giving away a copy of The Graveyard Book by Neil Gaiman himself (YA Fantasy, UK paperback). GIVEAWAY IS NOW CLOSED -Thanks to all you entered!